Earlier this week, U.S Immigration and Customs Enforcement announced in a press release that they arrested five illegal aliens from four different countries, including an Indian national wanted for assault and sexual abuse, after New York City refused to cooperate federal immigration law. “Detainers serve as a legally-authorized request, upon which a law enforcement agency may rely, to continue to maintain custody of an alien for up to 48 hours so that ICE may assume custody for removal purposes,” according to the October 18 press release. But some cities simply "catch and release" these criminals in hopes of promoting cooperation between the city and the illegal alien community. In fact, Mayor Bill De Blasio orders that the New York City Police Department routinely ignore these requests. De Blasio officials have said that their sanctuary city policies promote public safety. Though it is unclear whether this policy promotes any cooperation, it is endangering citizens of New York. 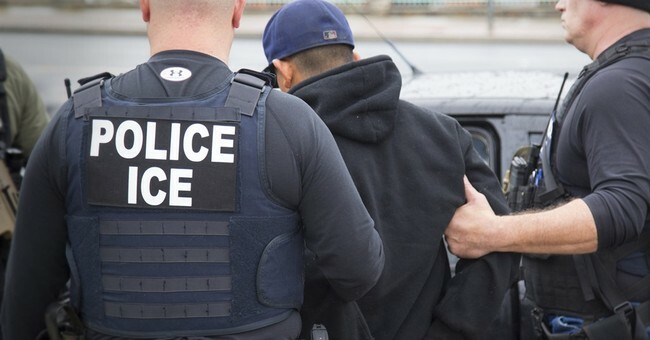 Just this week, ICE arrested five illegal aliens who had previously committed other crimes after New York City refused to hand them over to federal authority. One of those illegal immigrants is Gurnham Signh, a citizen of India who has previously been arrested four times. The press release notes, “On Dec. 26, 2016, Singh was arrested by the New York City Police for misdemeanor charges. He was later released on his own recognizance. Days later, he was arrested again by NYPD on charges of criminal contempt. He was released on bond Jan. 11, from the New York City Department of Corrections (NYDOC). On June 15, Singh was again arrested by NYPD for criminal contempt, assault, criminal mischief and harassment. He was arraigned on June 21, in Queens Criminal Court, on local charges, and subsequently released from custody on bond. Singh “has pending charges for assault, forcible touching, sexual abuse and harassment.” But he is not alone. ICE also arrested Ecuadorian citizen Marco Freiire, Jamaican citizen Steven Anthony Beswick, and Mexican nationals Omar Castro and Jonathan Aparici just this week as well. All of these men are illegal aliens and all have been arrested for various degrees of drug possession or violence in the past. But, NYPD has never reported them to authorities. In their desire to appear politically correct, De Blasio’s administration is allowing criminals to roam the streets. “ICE is focused on removing public safety threats, such as convicted criminal aliens and gang members,” but this becomes difficult when cities refuse to cooperate. So ICE takes matters into their own hands and tracks and arrests these aliens themselves.